by Patrick Miller - Written by a real painter!!! The Paint Estimator has many tools so you can make good business decisions down the road. What works and what does not. On the left is a chart showing where your top 10 referrals are coming from. 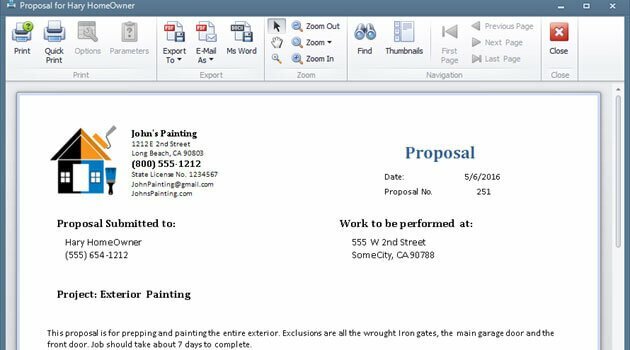 Your customers will be impressed by the professional looking proposals you send them. 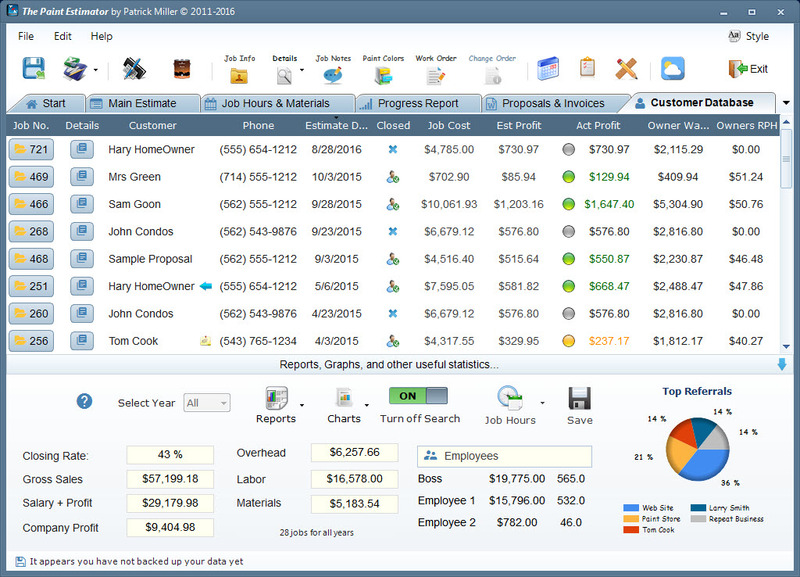 Keep track of all your customers, their jobs, profits, and more. Use the seach feature to display only the jobs you received from your website or other referrals you might have. A good portion of this program has been written off of my own personal experiences. I have been a painting contractor for close to 25 years now and have performed close to 1500 estimates in that time frame. I also have many friends that are painting contractors as well. Talking with them and from my own experiences, I tried to put together a software program that most painters can relate to. Include the stuff you need and leave out the stuff you don't. There are several features that have been added to the program that were from people like you who use this software. I'm always open for feedback either good or bad. So if you ever have any ideas, let me know. I can't promise anything but will take a look and see. Just simply try it out and if it works, great, if not then no biggie. I know The Paint Estimator will not be for everyone. So if you’re in the market for estimating software for your painting business, then you should give this a try. It does not take long to set up, and before you know it, you will be creating great looking proposals with accurate prices for your customers. There are many great features that this software has to offer. Track your progress as you move along in your jobs, track where your jobs are coming from, create change orders, work orders, employee reports and much more. One of the best things of all, is it’s a onetime fee. This means you will receive lifetime updates and support without having to pay again. A few more things worth mentioning here. You will not receive daily BS Spam emails from me like other software company's out there. This is not a Online service where you have to pay monthly fees in order to use the program. 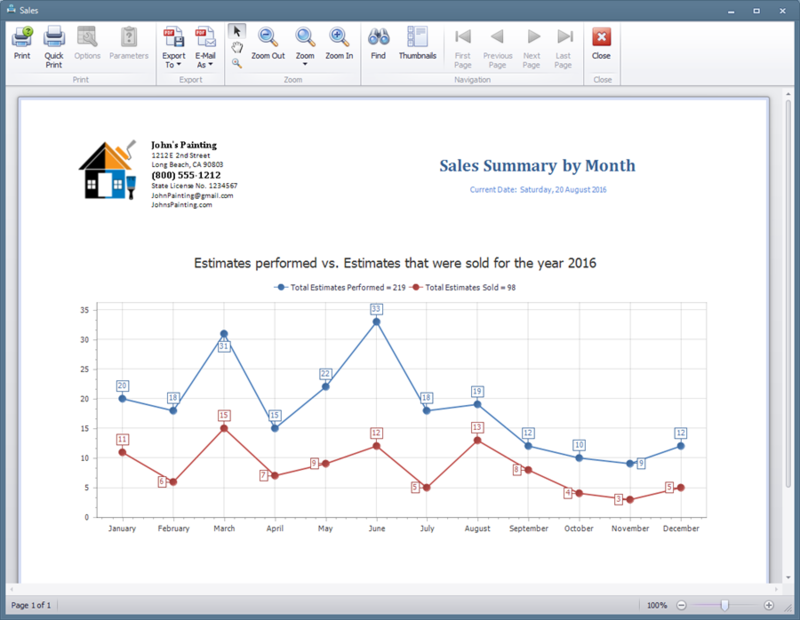 You don't need to have Microsoft Word or Excel to use this program. All you need is computer with Windows 7 or higher operating system. 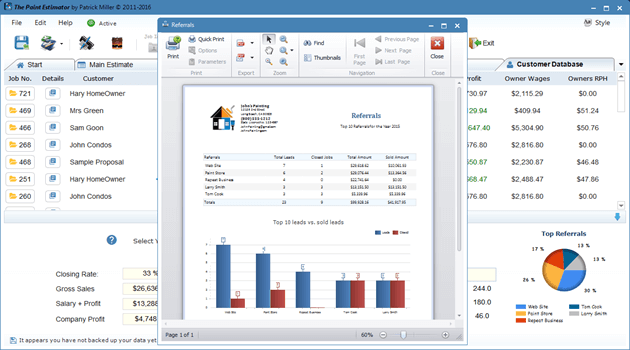 Export proposals to PDF, HTML, DOCX, RTF and OpenOffice files. 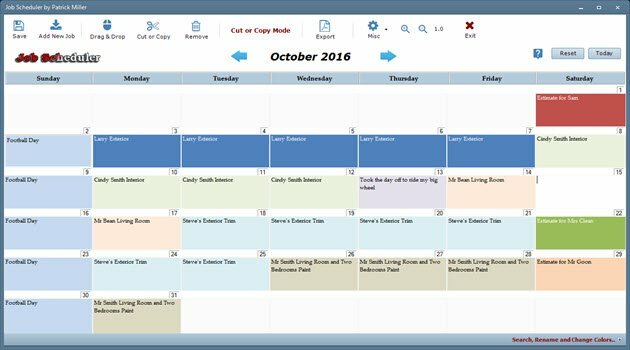 Work Orders, Change Orders, Employee Reports, Time sheets, Terms and Conditions and a reference list that can be attached to your proposals. Comes with a pre built material list that has most of the Benjamin Moore product line. 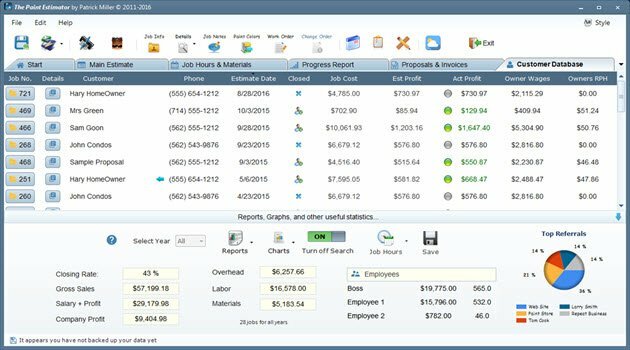 Production Rate Recorder where you can input what you did for the day and it will tell you the rate to charge in the future. 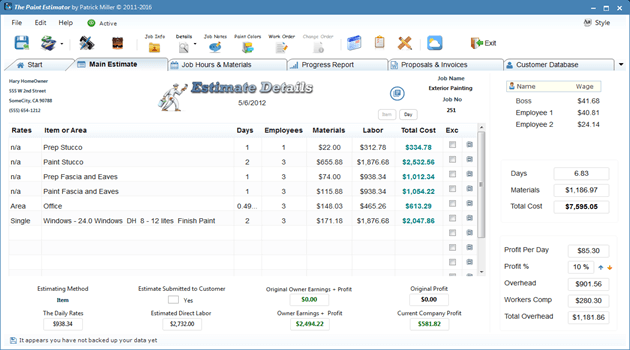 A customer database page where you can view all your estimates. Ready to try it out? Download The Paint Estimator and test it out for 5 days for Free. 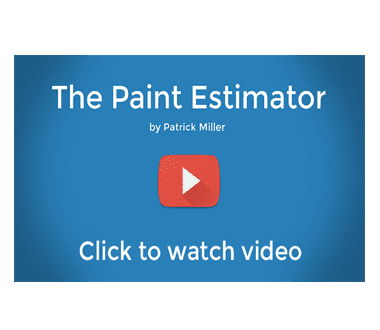 The Paint Estimator has been around for over 7 years. 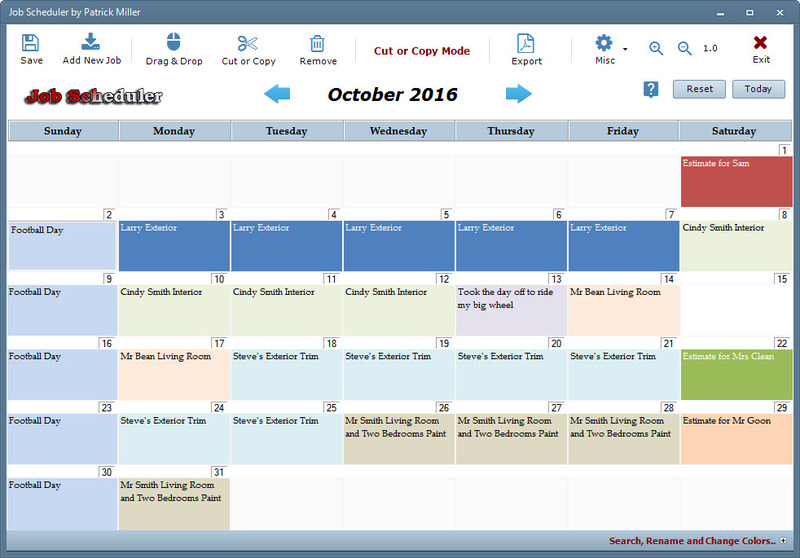 It continues to get updated 2-3 times a year with new and improved features. More then one method to estimate your jobs. Oh yeah! A few more things worth mentioning! Custom Services: Anytime you need help with something, Just send me an email and I will be happy to assist with any issues you might have! You can use your own logo or choose from one of the stock ones. If you need help, just let me know and I will modify your logo so it looks great. As long as this program is around and active, you will get support if you every have any issues. This does not expire like others out there. Pretty cool, hey? You will only have to pay once. You will receive all future updates, support and all else that comes with this program. Unlike others out there, there is no monthly fee, or will you ever have to renew your license. If you every need another license for say another computer, or you are installing on a new computer, then just let me know and I will be happy to send you one. If you ever have any suggestions or ideas, then please let me know. I can't promise anything but I will look into and see if I can add it the program for the next update. If you have a question that is urgent, then just send me a email with your phone number and I should be able to call you right back. Unless I'm up on a ladder or something. Remember, I also paint for a living. Special Note: I'm in the Pacific Time Zone "California"
Finally something I can relate to. Thanks Pat for making something that is easy to use. Thanks for the quick responses when I have a question. This program is great and just what I needed. 6.1.0.0 has been released on Dec 21, 2018. Fixed the issue of not being able to check for updates due to TLS 1.2. Added a better way to add references, few other minor updates as well. 6.0.0.0 has been released on April 10, 2018. 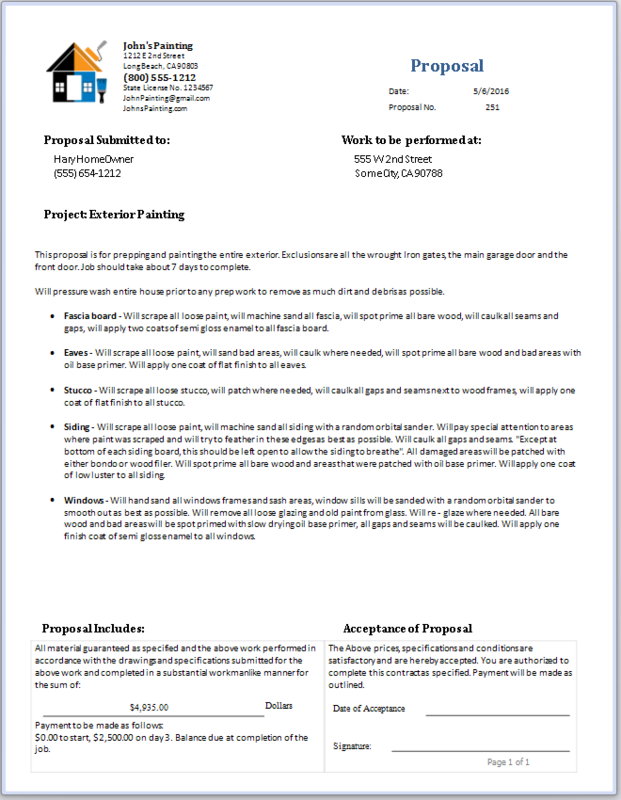 A new text editor for your proposals, a new proposal template. New theme, and several other features as well. 5.2.0.0 has been released on February 10, 2018. New features for the materials database and the production rates. 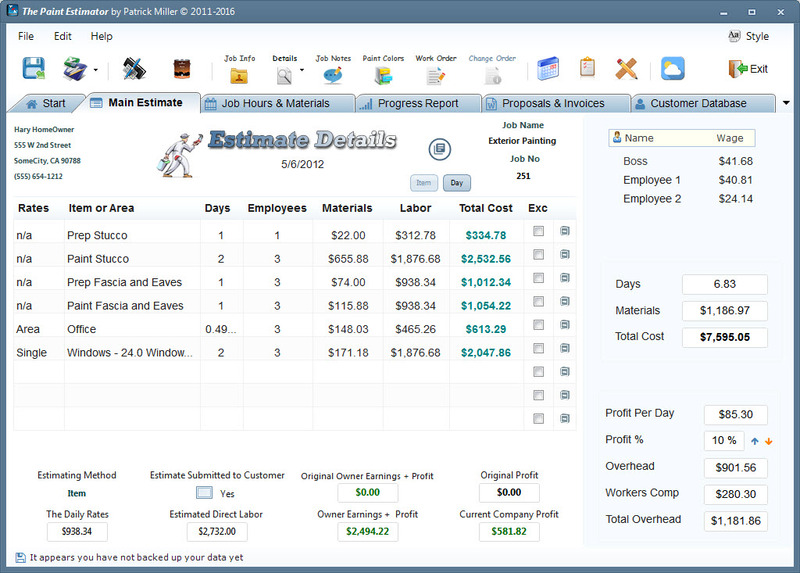 You now can update your production rates with a click of a button to reflect your current materials database prices. Few other new features as well. Copyright 2010 - 2019. The Paint Estimator. All Rights Reserved.